Nowadays Credit cards or bank cards are very important for us. Almost all the countries in the world has its own bank system that is used every day to solve problems and meet important needs and purchases. That’s why, we think that one should not forget about aesthetics in the era of modern technology. Each bank or company wants to be original and interesting for their clients. Stylish and modern design can help to become as popular as necessary among the needed target audience. If you have a goal to show your design or attract the attention to your creative idea, these awesome and really professional Credit Card – 2 Free PSD Mockups can be very helpful! Work with smart layers and qualitative elements using Photoshop. 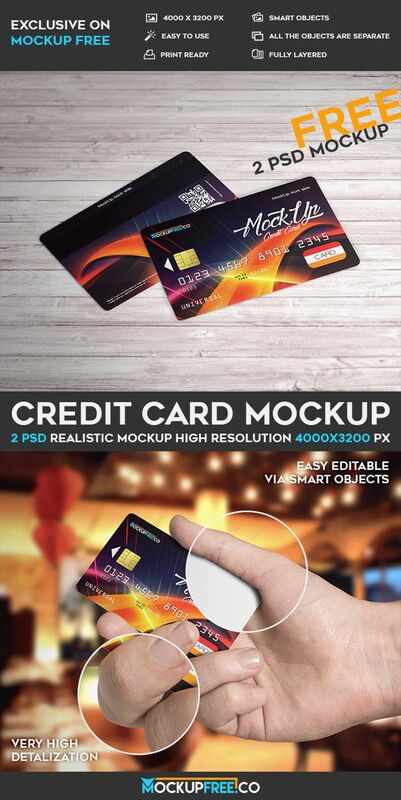 This PSD credit card mockup can be used as many times as necessary. It is important to know that it is really very easy to customize our mockups, add there the necessary design, change backgrounds and add any elements you wish. Our PSD mockups were created by professional designers exclusively for Mockupfree. Easily download these qualitative Credit card mockups for implementing your professional ideas, for showing the necessary design to your clients or customers and for lots of other interesting ideas and aims you have!